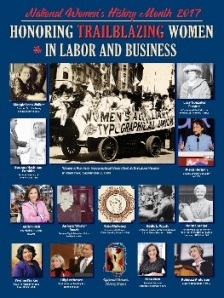 In my line of work as a women’s historian, every month is women’s history month. Still, it’s nice to have a month designated for a special observation of the history of those who make up more than half of the population. This year’s theme is trailblazing women in labor and business. One of the women being honored by the National Women’s History Project is Kate Mullany, who in 1864 started what is considered to be the first all-women union in the United States, the Collar Laundry Union of Troy, New York. After a five-day strike, laundry owners began to capitulate to the workers’ demands and implemented a 25% pay hike. Women continue to be an indispensable part of working-class activism into the 21st century. I think one of the most exciting things about women’s history is that we are only just starting to scrape the surface into this all to often undocumented half of human history, there is so much left to discover – it’s a great time to be a history nerd. I agree. My interest has always been in those women who are largely unknown.